New electrode technologies dramatically increase the number of cells and length of time that scientists can record from the brain. When Jason Chung woke up early on December 22 of last year, he opted to avoid his morning coffee. The graduate student would need steady hands for the grueling 18-hour surgery ahead of him, his first attempt at implanting more than 1,000 electrodes in a tiny rat brain. Over the course of the day, he would perform 10 tiny craniotomies, each opening implanted with one or more 64-electrode probes. Chung, who works in Loren Frank’s lab at the University of California, San Francisco, would soon be able to simultaneously record from hundreds of neurons across the brain. The technology is one of a growing number of super-sized electrode systems that promise to change how neuroscientists listen in on the brain. It was designed in collaboration with Vanessa Tolosa, a chemical engineer formerly at Lawrence Livermore National Laboratory in Livermore, California. Existing electrode systems for rodents typically target one to tens of neurons at a time, extending to 100 to 200 neurons in the hippocampus. But this limited snapshot may miss what the brain is doing more broadly. Researchers hope that the ability to record from hundreds to thousands of cells will provide a new picture of the coordinated activity in the brain. “It will allow us to answer important questions about how areas talk to each other, evolve during learning and make decisions,” says Frank, an investigator with the Simons Collaboration on the Global Brain (SCGB). Indeed, the new technology may open a new avenue for neuroscience. “These probes will force us to do a type of science no one has done before — to look at how the whole brain works together,” says Kenneth Harris, a neuroscientist at University College London and SCGB investigator. The biggest challenge in designing dense electrode devices is keeping them small — additional sensors and the electronics that accompany them take up space, and larger implanted devices are more likely to damage the brain. “The smaller you make the shank [the long, narrow part of the device that is inserted into the brain], the less real estate you have to place electrodes and everything else you need,” says Evgueniy Lubenov, a research scientist at the California Institute of Technology (Caltech). The issue is compounded in rodents, whose tiny brains are roughly a centimeter deep, leaving little space for complex electrode arrays. To get around this problem, researchers design and manufacture devices using microelectromechanical systems (MEMS), the same technology used for motion sensing in cell phones. This technology allows scientists to pack more sensors onto smaller devices, expanding the ability to listen in on the brain’s electrical code. The new device dramatically enhances recording capacity. 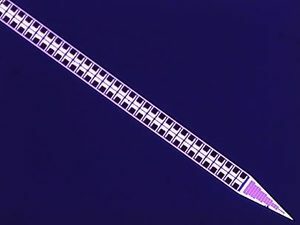 The most commonly used electrophysiology technology in use today — twisted-wire electrodes known as tetrodes — have four sensors in a probe roughly 1,300 square microns. Typical silicon probes, which are manufactured in university MEMS foundries, house 64 sensors in a 1,050-square-micron device. The Imec probe packs nearly 1,000 recording sites onto a single shank about 1,400 microns square and 10 millimeters long, which spans the full depth of a rat brain. One of the biggest challenges in designing dense electrode arrays is figuring out how to process the data the many sensors record and pipe that data out of the brain, all under serious size constraints. “You have to integrate, amplify and sort the signals, then digitize and combine them into one or a few data streams,” Harris says. Most existing systems send data through a wire to an external computer. Imec designed an integrated system that packs the digitizers, amplifiers and other components required to process data onto a single chip that lives on the animal itself. “The chip does the equivalent of what a server does, combining 384 channels into a single data stream,” Harris says. Kenneth Harris and his collaborators at University College London are testing the new probes, which can be used in freely moving animals. Imec has produced an early test batch, which will be distributed to a smattering of beta testers around the world at institutions selected by the funders. “I get calls all the time: ‘How do I get some probes?’” Tim Harris says. “We are in very limited production at the moment.” Researchers will eventually be able to buy the probe at cost from Imec beginning in 2018. Lubenov, Michael Roukes, Athanassios Siapas and Gustavo Rios at Caltech have taken a different tack, developing a modular device with more than 1,000 sensors. Their probe differs from other efforts in that the recording technology is separate from the electronics that process the electrical signals. That enables researchers to create probes with different configurations and attach them to the same electronics package. The modular device has three basic components — the probes themselves, the electronics that amplify and process the electrical information, and a thin flexible wire that connects them. 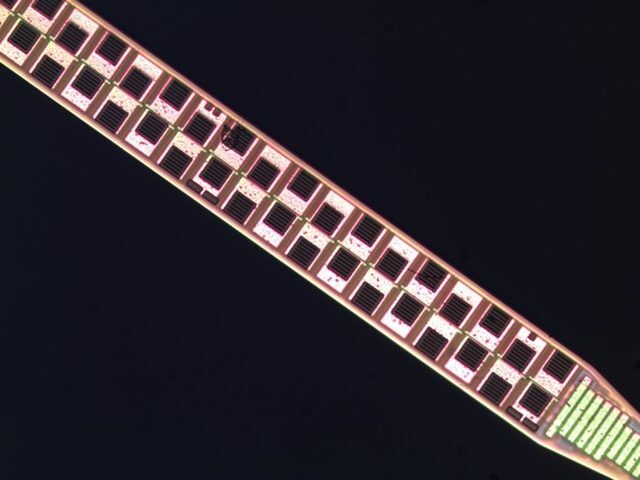 The recording portion of the device is made up of four two-dimensional silicon shanks, each with 256 electrode sites, sandwiched together into a 3-D structure. Each shank is roughly 50 microns wide and includes up to 100 sensors. The researchers published preliminary tests of the recording probes in head-fixed mice in Nano Letters in 2016. Siapas, Rios and Lubenov are developing new ways to assemble the 3-D arrays in custom configurations and chronically implant them in freely behaving animals. Most electrode arrays are stiff, an issue that concerns Loren Frank. A hard electrode inserted into soft brain tissue eventually kills surrounding neurons, and the electrode’s function decays with time. Frank, Tolosa, who recently moved to the private sector, and their collaborators are developing alternatives that employ soft flexible polymers that can penetrate the brain and do less damage to surrounding tissues. The 64-electrode devices in Chung’s experiment are the largest they’ve tested in animals to date. The researchers started with technology developed for artificial retinas, which can be implanted into the back of the eye in people with damage to their photoreceptors. “The technology is soft and flexible rather than rigid, and has lasted many years in the people it’s been implanted in,” Frank says. To make the material stiff enough to penetrate the brain, researchers use a biomimetic glue to attach a silicon stiffener — the glue dissolves in the saline environment of the brain, restoring flexibility. Researchers insert the electrode, tether it to the skull with a loose anchor, wait a few minutes for the glue to dissolve, and then pull out the stiffener, leaving the electrode in place. Frank’s flexible 64-channel probe, fabricated at the Lawrence Livermore National Laboratory. Credit: LLNL/Frank lab. Chung’s ongoing experiment employs 16 64-channel probes, for a total of 1,024 electrodes. Each probe records from roughly 30 cells, totaling 350 to 400 simultaneous cells across the multiple implanted regions. “That’s five times as many as we had been able to get before,” Frank says. He predicts they will be able to double or triple the number of recorded cells in a future implant. Janelia’s Tim Harris concurs. Lots of cool tools have been built, “but they die in place because there is no strategy for getting them out,” he says. “I think people are excited about our project because when we’re done, you get to buy them.” The Imec chips are being produced by a nonprofit and will be relatively inexpensive, about 1000 euros each. But Imec won’t provide the customer service that technology companies typically do. “We as a community have to figure out who’s going to do that,” Harris says. A second major challenge is dealing with the vast amounts of data — terabytes per day — that these technologies produce. “We need software that can accurately and quickly extract the information you need,” Kenneth Harris says. The Wellcome Trust has given Harris and his collaborators a grant to develop consumer-grade software for spike sorting, algorithms that allow scientists to link electrical activity to specific cells, as well as other software and training programs.